Wedel and Taylor (2013a: figure 9). Degree of neural spine bifurcation of presacral vertebrae in well-preserved Morrison Formation sauropod specimens representing several taxonomic groups. In all taxa with deep bifurcations, these are concentrated around the cervico-dorsal transition. 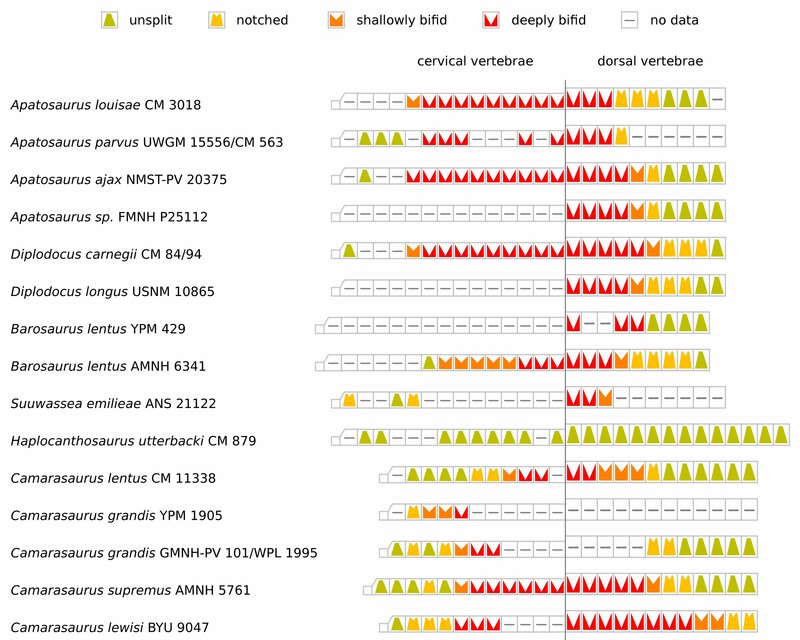 ‘No data’ markers may mean that the vertebrae are not preserved (e.g., posterior dorsals of Suuwassea emilieae ANS 21122), that the degree of bifurcation cannot be assessed (e.g., anterior cervicals of Barosaurus lentus AMNH 6341), or that the serial positions of the vertebrae are uncertain so they contribute no information on serial changes in bifurcation (e.g., the four cervical vertebrae known for Barosaurus lentus YPM 429). The Camarasaurus specimens are roughly in ontogenetic order: C. lentus CM 11338 is a juvenile, C. grandis YPM 1905 and GMNH-PV 101/WPL 1995, and C. supremus AMNH 5761 are adults, and C. lewisi BYU 9047 is geriatric. See text for sources of data. But downloading, compiling and running Perl programs is not everyone’s cup of tea. So when Emanuel “Brontosaurus” Tschopp wanted to use it to illustrate the presence and absence of various laminae along the vertebral columns of lizards, I put a running copy online so that he — and anyone else — could play with it. S9 Table. Postspinal lamina (POSL), serial variation in presacral vertebrae of Lacertini. Boxes represent the vertebrae in the column, including the atlas. 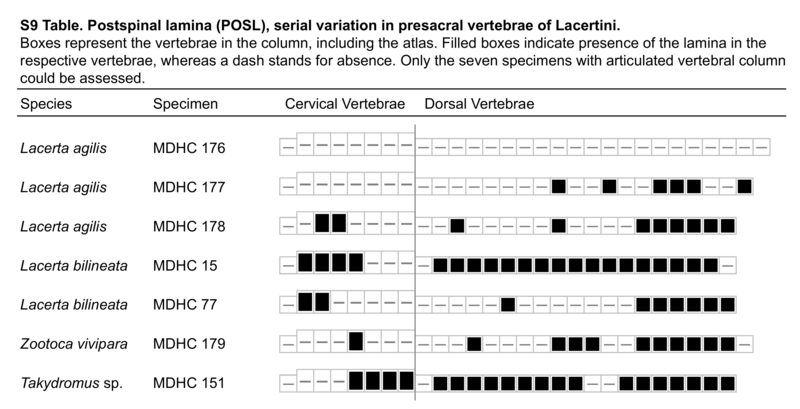 Filled boxes indicate presence of the lamina in the respective vertebrae, whereas a dash stands for absence. Only the seven specimens with articulated vertebral column could be assessed. I’m delighted that this program has been put to good use, and once again commend it to anyone who needs to produce similar diagrams. Free to download, free to use online. Have at it! Wedel, M.J., and Taylor, M.P. 2013a. 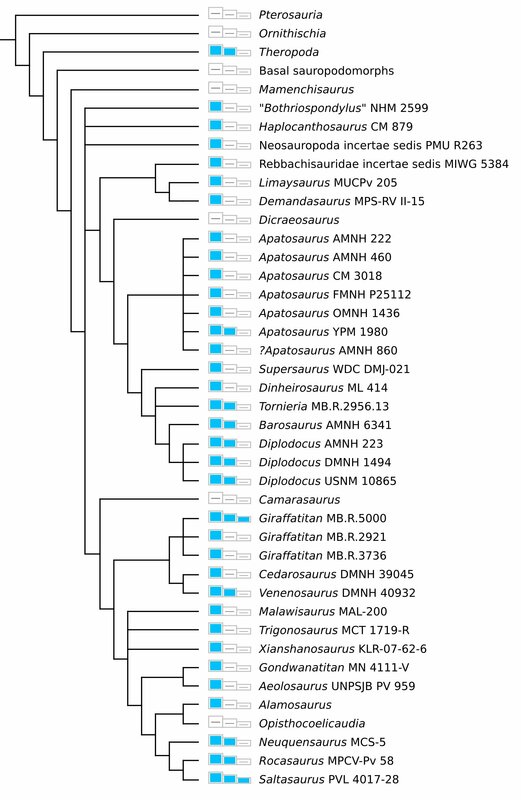 Neural spine bifurcation in sauropod dinosaurs of the Morrison Formation: ontogenetic and phylogenetic implications. Palarch’s Journal of Vertebrate Palaeontology 10(1):1-34. ISSN 1567-2158. Five days ago, I released a program for drawing comparative figures of vertebral columns, such as this one from our neural-spine bifurcation paper. With my idiot computer-scientist hat on, I gave that program the startlingly unmemorable name vcd2svg — the reasoning being that it takes Vertebral Column Descriptions and translates them into Scalable Vector Graphics. Your target users don’t have VCD files, don’t want to convert anything, and have little or no preference for SVG. They want to make diagrams of vertebrae. A fair point. Accordingly, I have renamed the program VertFigure — a name chosen in part because Google doesn’t know of anything else with the same name. The canonical GitHub page is now http://github.com/MikeTaylor/VertFigure but the old address still works, and git checkouts made from the old name will also continue to work. The command-line program that does the conversion is now also named VertFigure. Back when the paper came out, Matt rashly said “Stand by for a post by Mike explaining how it came it be” — a post which has not materialised. Until now! This illustration was (apart from some minor tweaking) produced by a program that I wrote for that purpose, snappily named “vcd2svg“. That name is because it converts a vertebral column description (VCD) into a scalable vector graphics (SVG) file, which you can look at with a web-browser or load into an image editor for further processing. Basically, you draw little ASCII pictures of the vertebral column. Other directives in the file explain how to draw the various glyphs represented by (in this case) “Y”, “V”, “u”, and “n”. Wedel and Taylor (2013b: Figure 2). The reason I mention this is because I released the software today under the GNU General Public Licence v3.0, which is kind of like CC By-SA. It’s free for anyone to download, use, modify and redistribute either verbatim or in modified form, subject only to attribution and the requirement that the same licence be used for modified versions. vcd2svg is written in Perl, and implemented in part by the SVG::VCD module, which is included in the package. It’s available as a CPAN module and on GitHub. There’s documentation of the command-line vcd2svg program, and of the VCD file format. Also included in the distribution are two documented examples: the bifurcation heat-map and the caudal pneumaticity diagram. Folks, please use it! And feel free to contribute, too: as the change-log notes, there’s work still to be done, and I’ll be happy to take pull requests from those of you who are programmers. And whether you’re a programmer or not, if you find a bug, or want a new feature, feel free to file an issue. A final thought: in academia, you don’t really get credit for writing software. So to convert the work that went into this release into some kind of coin, I’ll probably have to write a short paper describing it, and let that stand as a proxy for the actual program. Hopefully people will cite that paper when they generate a figure using the software, the way we all reflexively cite Swofford every time we use PAUP*. On Vertebrat’s suggestion, I have renamed the program VertFigure. Swofford, D. L. 2002. PAUP*: phylogenetic analysis using parsimony (* and other methods). Sinauer Associates, Sunderland, MA. Wedel, M.J., and Taylor, M.P. 2013. Neural spine bifurcation in sauropod dinosaurs of the Morrison Formation: ontogenetic and phylogenetic implications. Palarch’s Journal of Vertebrate Palaeontology 10(1): 1-34. ISSN 1567-2158. Filed in DIY, neural spine, papers by SV-POW!sketeers, software, What counts?